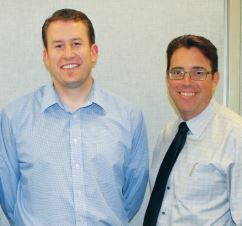 Ian McFeat was recently promoted to executive director of student services for the La Cañada Unified School District and Jim Cartnal was named interim La Cañada High School principal. La Cañada High School Principal Ian McFeat has been promoted to executive director of student services for the La Cañada Unified School District after expressing a long-term interest in a district-level position. “He’s articulated that,” said LCUSD Superintendent Wendy Sinnette in a telephone interview on Tuesday. McFeat, who has been the LCHS principal since 2012, had asserted he could perform well in the executive director role, she said. 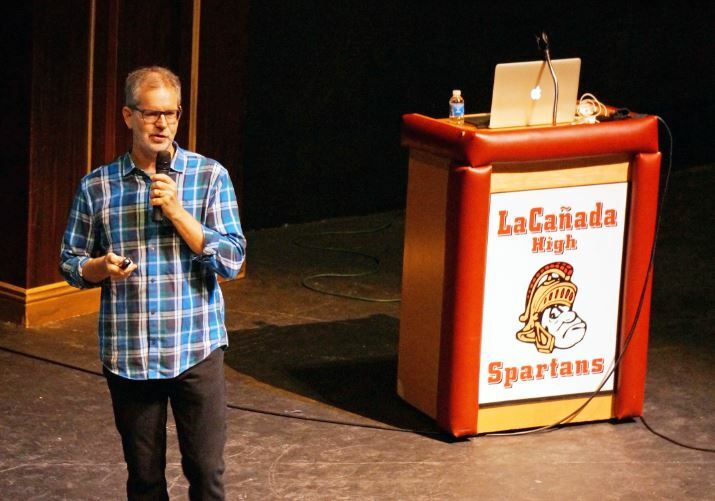 Principal Jarrett Gold told LCHS 7/8 students, “This is you guys being part of the conversation and having a voice,” and they responded by sharing thoughts on a range of topics, including vaping, bullying and school safety. 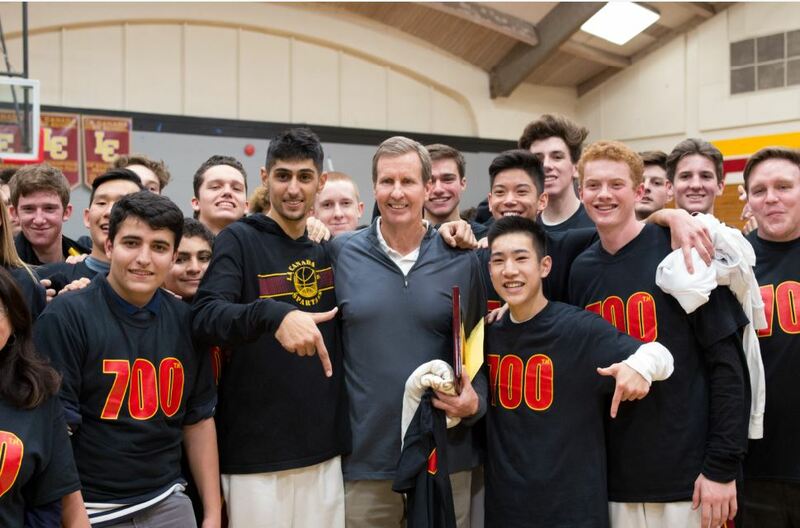 La Cañada High School varsity boys’ basketball coach Tom Hofman records his 700th career victory on Friday, Jan. 19. A ceremony following the Spartans’ 82-55 victory over rival South Pasadena celebrated the coach’s milestone. 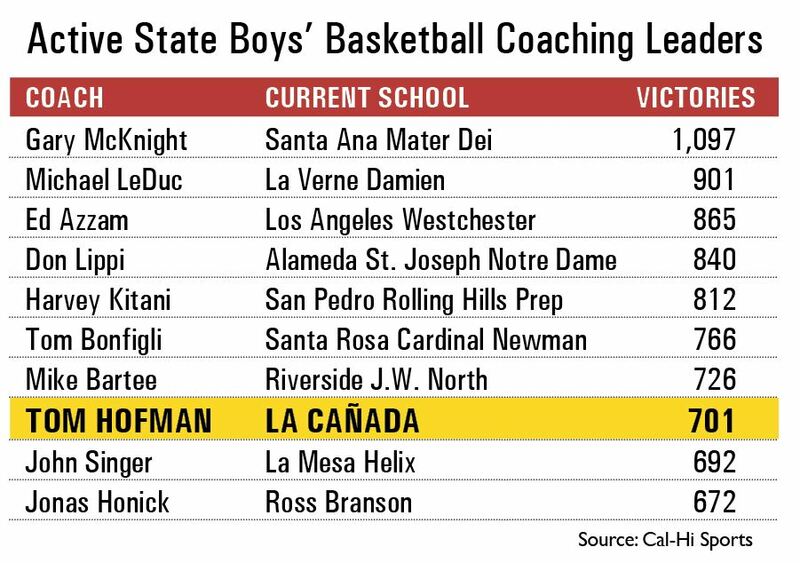 Hofman is the 17th coach to reach 700 victories in California, according to Cal-Hi Sports. The legend of La Cañada High School varsity boys’ basketball coach Tom Hofman continues to grow after he guided the Spartans to an 82-55 Rio Hondo League victory over visiting South Pasadena on Friday, Jan. 19. The win was No. 700 for Hofman, placing him among the 17 winningest coaches in California, according to Cal-Hi Sports. He is eighth on the list of active boys’ basketball coaches in the state. Among those who attended a recent summit of church and educational leaders are (front row, from left) Wendy Sinnette, Kip Glazer, Rosemary Johnston, D.J. Severin, Tanya Wilson, Sister Celeste Botello, Allison Clay, Father Christopher Iwancio, Will Moffitt, Lucinda Guarino and the Rev. Chuck Osburn. Back: Connie Knight, Peter Bachmann, Ian McFeat, Katie Phillips-Rector, David Gill, Jim Cartnal, the Rev. Anthony Keller, Rick Callister, Kyle Sears, Andrew Shaw, Eddie Mariel, the Rev. Msgr. Antonio Cacciapuoti and the Rev. Jeff Hoffmeyer. Church leaders in La Cañada Flintridge recently invited educational leaders to lunch at La Cañada Presbyterian Church. The purpose was to better understand the challenges facing today’s youth and to identify some ways the local churches can be more helpful to students and their families. Principals, headmasters, counselors and disciplinarians shared many of the most acute and many of the most pervasive challenges their students are facing in their learning experience. The collective wisdom of these educational leaders proved valuable to church leaders and will help them reshape their efforts with young people and their families going forward. Representatives from La Cañada Unified School District, St. Francis High School, Flintridge Sacred Heart Academy, Flintridge Preparatory School and the Community Prevention Council had unique perspectives and shared some common challenges — stress, anxiety and depression were common, as were various destructive coping mechanisms (substance abuse, technology and social media abuse, and self-isolation). A La Cañada High School student was transported by ambulance to an area hospital with non-life-threatening injuries after being struck by a vehicle in the crosswalk at Oak Grove Avenue and Foothill Boulevard before school on Wednesday morning, according to Crescenta Valley Sheriff’s Deputy Eric Matejka. 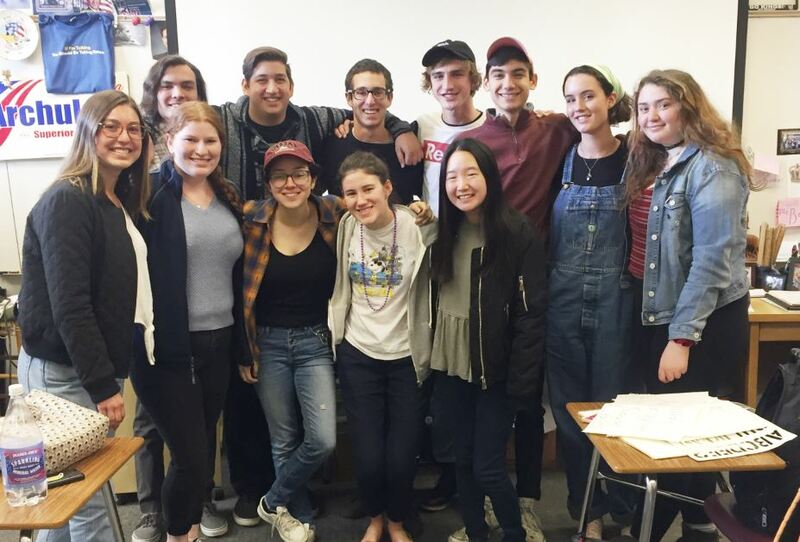 All seniors attending La Cañada High School, their families and community members are invited to the La Cañada Interfaith Baccalaureate Service at St. Bede the Venerable Catholic Church on Tuesday, May 30, at 7 p.m. A reception follows the program. This year’s baccalaureate keynote speaker is Aziza Hasan, a passionate advocate for coalition building, peacemaking and interfaith relations. As executive director of NewGround, a Muslim-Jewish partnership for change, Hasan is a bridge-builder and conflict-resolution practitioner. Ian McFeat, principal of La Cañada High School will deliver opening remarks. As a celebration of students’ faith, baccalaureate includes the reading of scriptures and testimonies by seniors who are active in local Islamic, Jewish and Christian congregations. Musical offerings will be provided by the LCHS Choral Artists and the La Cañada Presbyterian Church Youth Worship Band. Students witnessed the consequences of a simulated crash — not an unavoidable “accident,” Assistant Principal Mary Hazlett said. Some said it will make them think twice before drinking and driving. 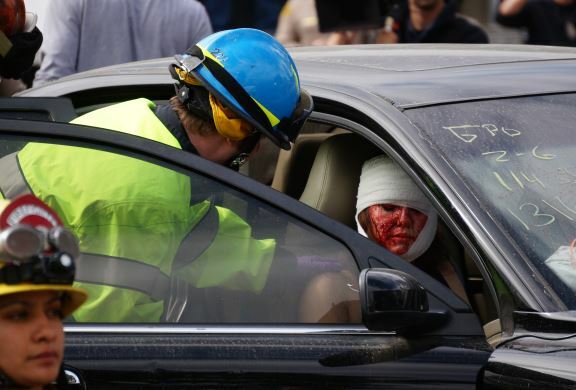 A simulation of a gruesome crash was staged in front of La Cañada High School on Thursday, April 13, as part of “Every 15 Minutes,” a nationwide program meant to increase awareness among teenagers about the high-stake dangers of drinking and driving. Name another high school that can pool an Oscar winner, head of Plastic Surgery at Children’s Hospital Los Angeles, CEO of Warner Bros. Entertainment, creative executive at Walt Disney Imagineering, state Senator, former Major League Baseball player, NASA engineer, deputy district attorney, pilot and philharmonic oboist and have them all on the same campus, on the same morning. Chris Buck, the Oscar-winning director of Disney’s “Frozen,” speaks to students at Saturday’s “Challenge Success: Building Your Path” event about his career path, including hurdles he overcame along the way. 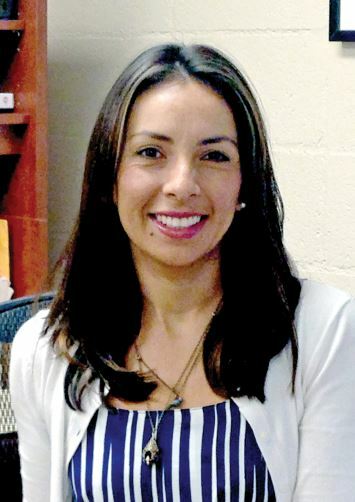 Christine Castillo, the former La Cañada Elementary School principal, has amended her lawsuit against La Cañada Unified School District to include wrongful termination, her attorney Ben Meiselas said Wednesday.